2009 Louis Braille Silver Dollars were launched in a ceremony Thursday at the National Federation of the Blind (NFB) Headquarters in Baltimore, Maryland. 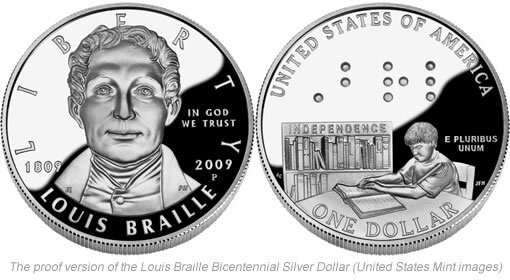 The commemorative proof and uncirculated silver dollars celebrate the 200th birthday and the life and work of Louis Braille, inventor of the Braille system for reading and writing by the blind and visually impaired. The United States Mint first released the Braille designs and a prototype in July 2008 during the NFB annual convention in Dallas, Texas. The unveiling showcased the unique silver dollar design, which US Mint Director Ed Moy told the audience about during Thursday’s ceremony. The silver coins feature a portrait of Louis Braille on the obverse (heads side) designed by Joel Iskowitz and sculpted by Phebe Hemphill. The reverse (tails side) design depicts a child reading a Braille book. The word INDEPENDENCE is displayed on a bookshelf behind the child and the word Braille, abbreviated BRL in Braille code, is featured in the upper field. The reverse was designed by Susan Gamble and sculpted by Joseph Menna. As Moy said, the coin is the first ever in the US to contain readable Braille characters. Three other coins — the Alabama state quarter and 1995 and 1996 Paralympic Silver Dollars — also had Braille, but were too small for the visually impaired to read. Each coin is struck from 90 percent silver and 10 percent copper. The silver content weighs about 0.773 troy oz. Joining Moy at the ceremony were NFB President Marc Maurer and NFB First Vice President Frederic Schroeder, a research professor and pioneer in orientation and mobility for the blind. According to the Mint’s press announcement, additional guests included noted mathematician and inventor Abraham Nemeth and Dr. Joyce Winterton, the Assistant Administrator for NASA Education. 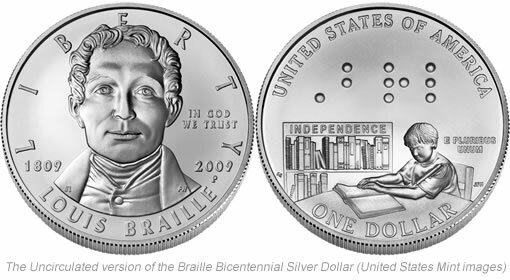 Winterton announced plans to carry the 2009 Louis Braille Bicentennial Silver Dollar aboard a future space shuttle flight. A limit of 50 units each per household is in effect during the first 30 days of release. Introductory pricing is available until April 27, 2009, at 5 p.m. (ET). *The mintage limit is 400,000 across all options. Within that, 25,000 coins are reserved for a special set that will be released later this year. $10 surcharges from the sale of each coin are paid to the NFB to further its programs to promote Braille literacy. The coins are authorized by Public Law 109-247, which was first introduced through coin legislation entitled Louis Braille Bicentennial Braille Literacy Commemorative Coin Act. The legislation includes many of the remarkable aspects of Louis Braille’s life, which is also summarized on the CoinNews sister site Silver Coins Today at 2009 Braille Bicentennial Silver Dollars.